One of the 24 gates to enter the stadium. The Estadio Azul, is a 35,000-seat stadium located in Mexico City. This sports facility is currently used for association football matches and previously (until 1990) for American football. 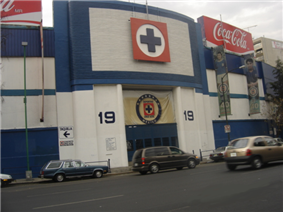 It is the home of Mexican football club Cruz Azul; it has been also home for Atlante F.C. (hence the nickname Estadio Azulgrana) and several home matches of the Mexico national football team, especially in the early 1990s. Both times when Mexico hosted the World Cup, Estadio Azul did not host any games mainly due to the age of the structure, the bad parking facilities and the complex traffic patterns. A peculiarity of this stadium is that it is built as a pit; the playing field is below street level. Another oddity is that just beside the stadium is the Plaza México, the world's largest bullring. Estadio Azul holds 35,161 people, including 92 boxes.